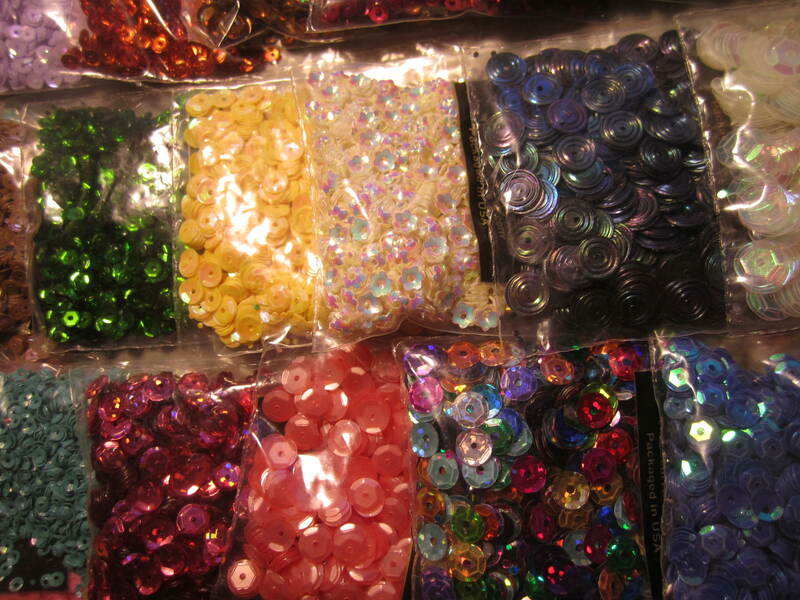 Sequins , sequins, sequins !! Just a warning, this is a very long post !!! 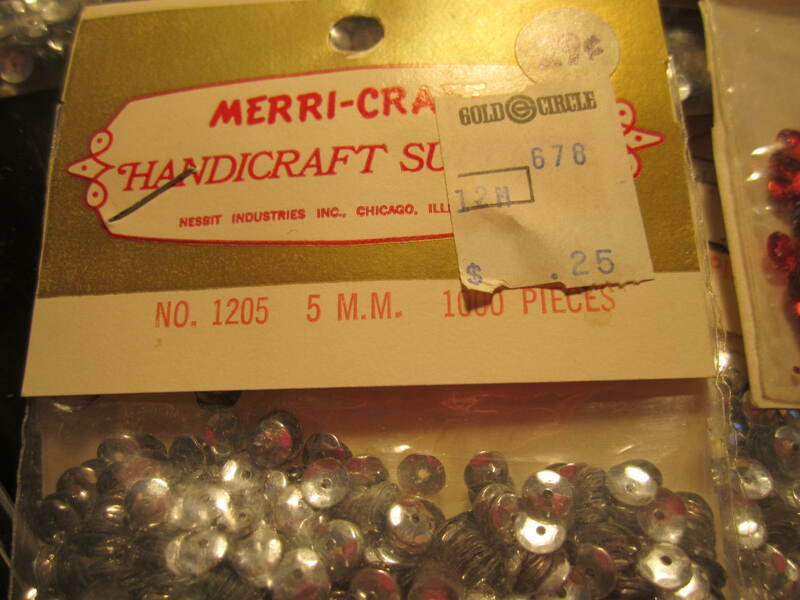 In case you could not tell from the title, this post is about sequins. 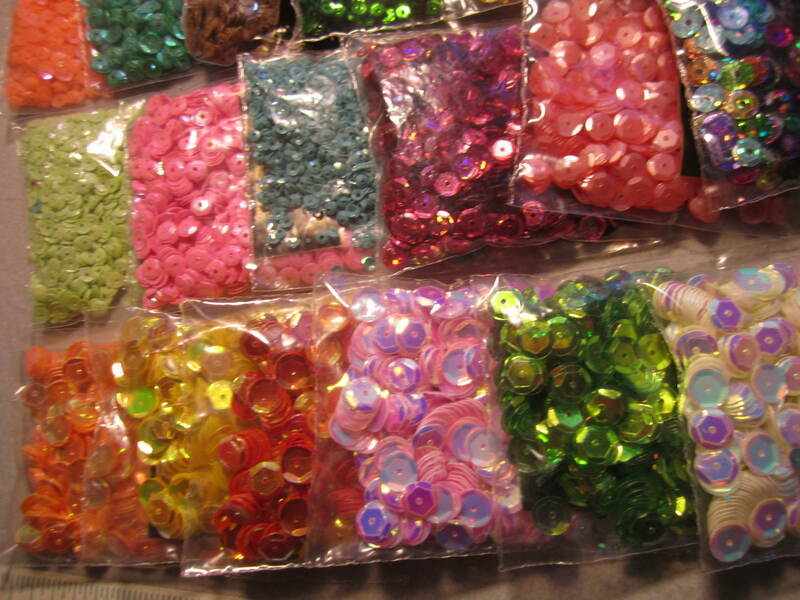 Sequins are my favorite craft and beading medium. I cannot put into words how much I love my sequins. 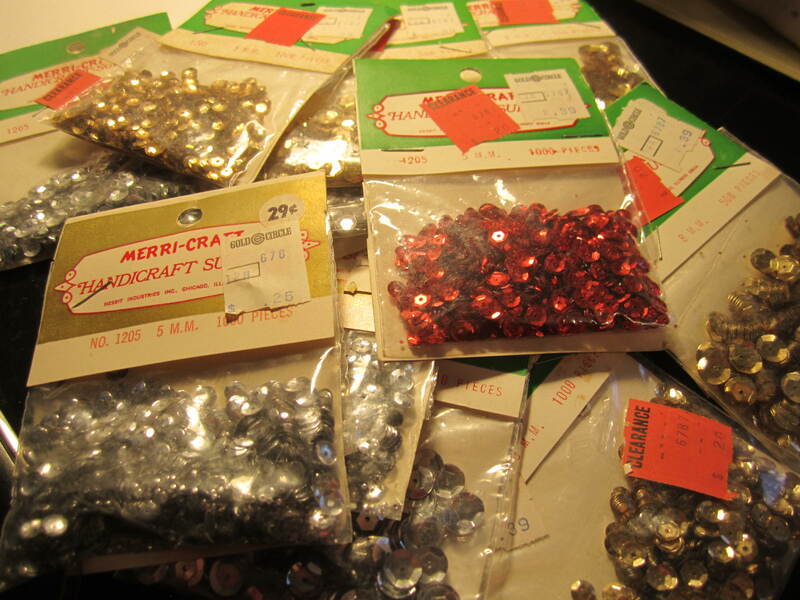 I started beading with sequins over twenty five years ago. I made some beaded angels and to this day, I cannot tell you how I came up with them. 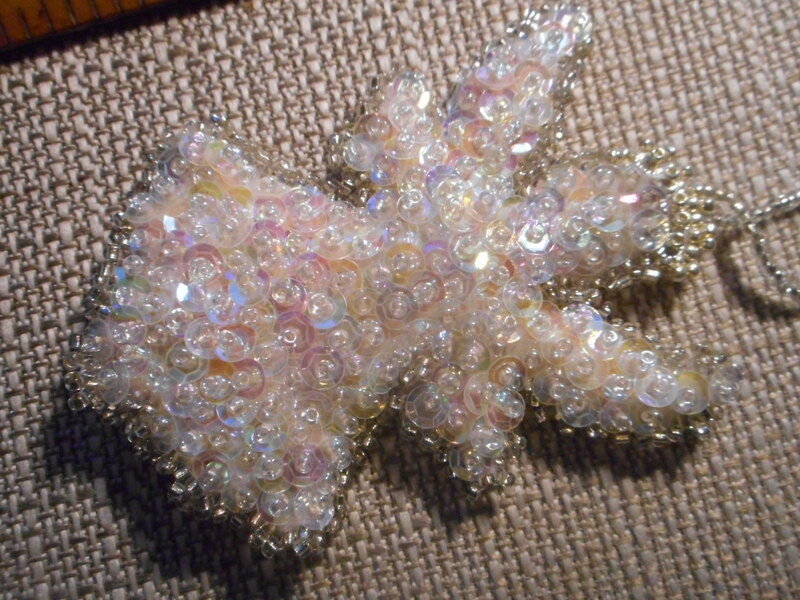 I made many angels over the years for gifts and beaded other fun items to give people. I recently stepped away from my jewelry business because I just was not getting any looks, let alone sales on Etsy. I feel Etsy has just gotten too big, and unless you are willing to pay to advertise on the site, not many of your items are seen. So, I felt it was time to walk away from my Etsy jewelry shop. It was not really my passion anyway. I thought and thought on it, and realized my true passion is working with the seed beads and sequins. Like many people, I got lured in by trying to make what I felt would sell, NOT what I loved creating. I got burnt out after a long period of no sales and realized I had to make a change. If it is not fun, and you are not passionate about it, what is the point ? 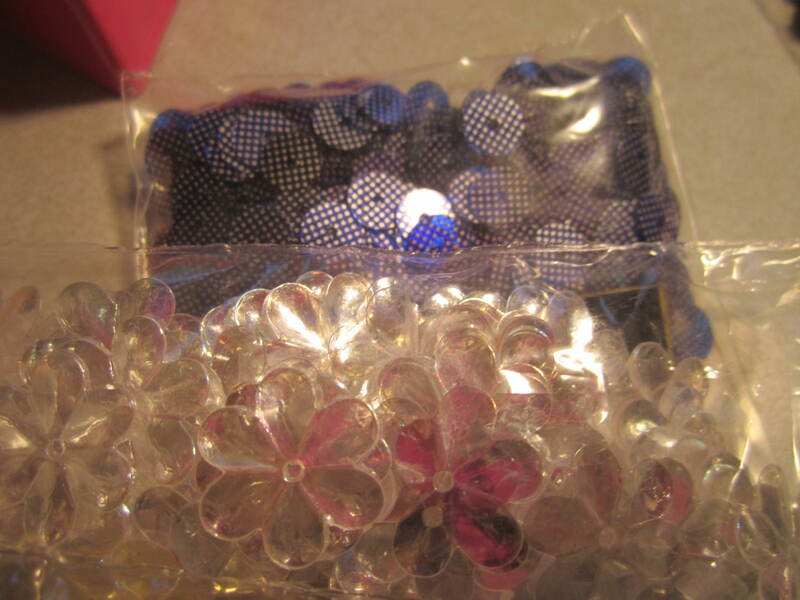 So, I am going to be working with seed beads and sequins. Beaded sequined ornaments, fringed beaded earrings, and seed bead bracelets and all kinds of pretties !! 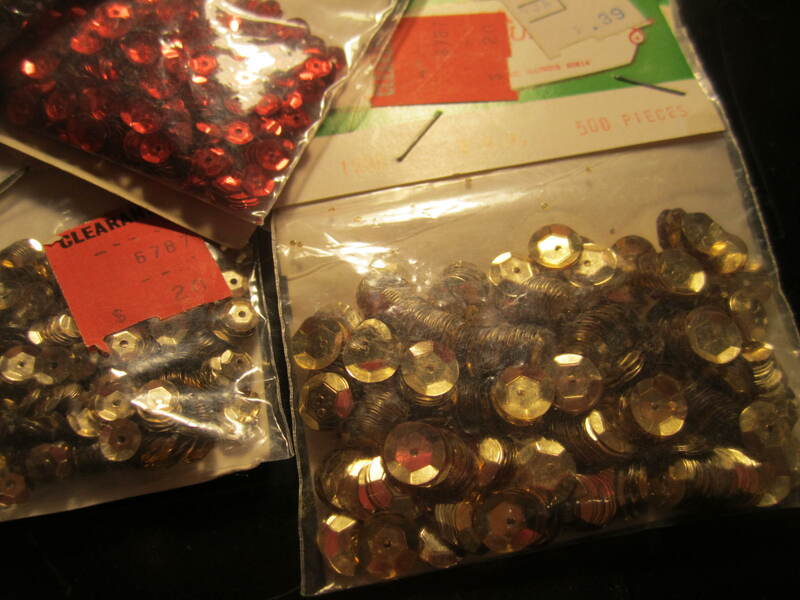 Back when I started, sequins were very limited. There was NO online 25 years ago for me to shop on, so what I could get at Michaels and the random craft stores was it. Not too many options. Red, green, gold silver, white, black, and some clear irredescent ones, which I still have five or so large bags unopened that are now yellowed from age, but still usable and pretty.When I was really lucky, some orange, brown or purple. As time went on I added some more, but they were mainly the metallic style. That is all I thought there was until about ten years ago. But now, the sky is the limit. 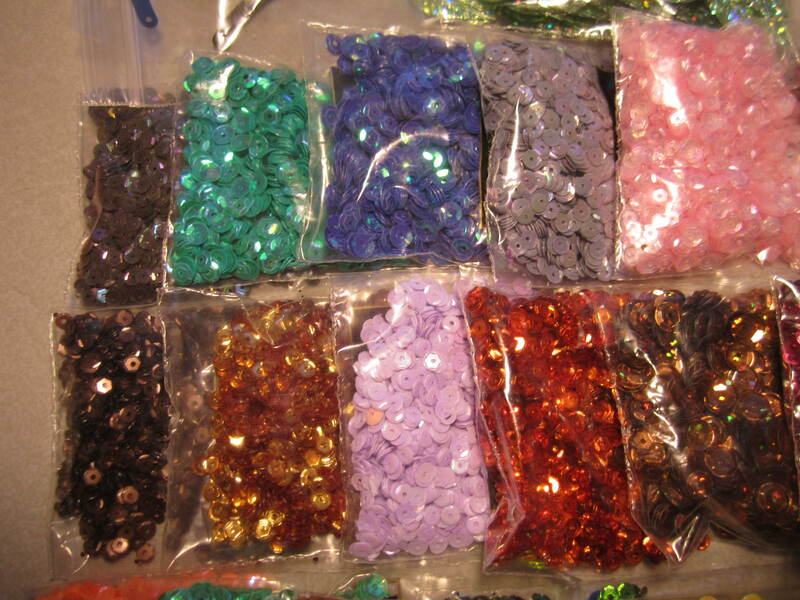 I can get sequins in any color I want. I have thousands of them, hundreds of packages in every color under the sun. Yellows, oranges, browns, reds, pinks, greens, blues, tans, whites, there are a lot of white sequins, you would be surprised . Irridescent, statin finished, glossy, matt, some holigram , some with designs and pictures on them. from 2 mm to 12 mm for standard looking and even bigger for special shapes. 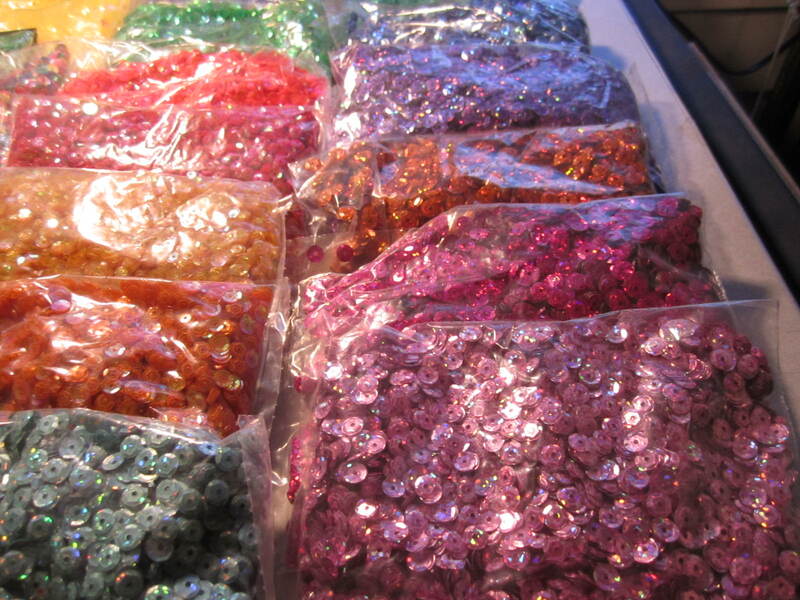 What I love about sequins, other than how pretty they are, is the price. They are very reasonable to buy. You can spend hundreds like I have, but you do not have to. 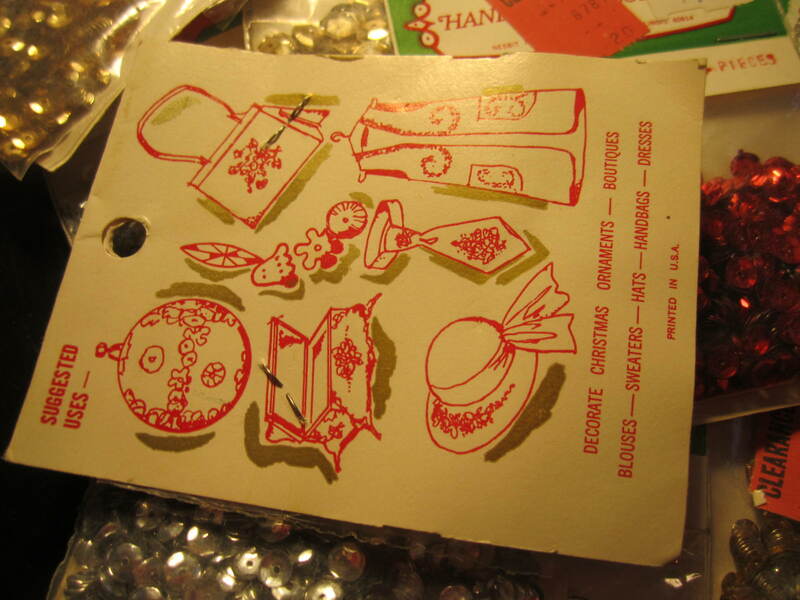 I have vintage ones, and vintage sequins on things, and so on. Most of which are really inexpensive to buy. I was able to buy a lot of them on clearance, and many of them in the big bags with thousands in the bags, from 8 to 12 thousand per bag. 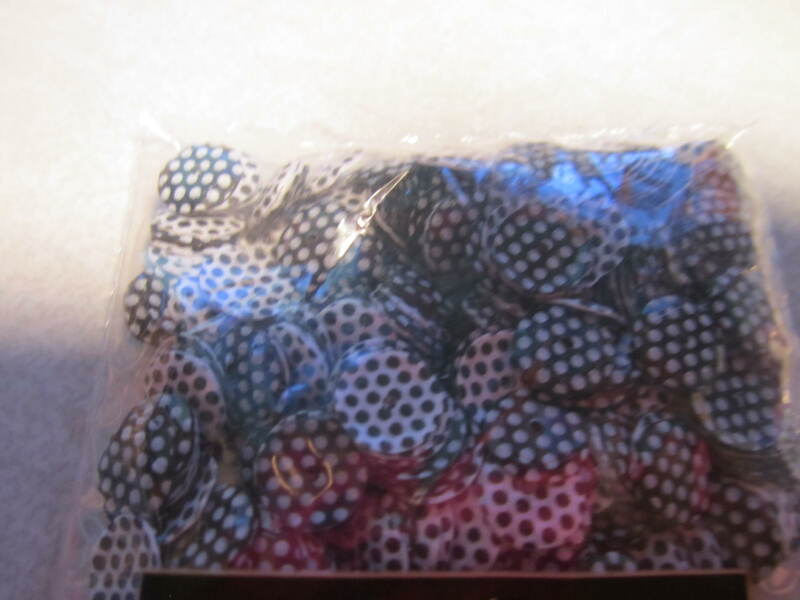 I can take these and rebag them and sell them , as kits to make ornaments, in bottles and in bags . That is what I am going to do. 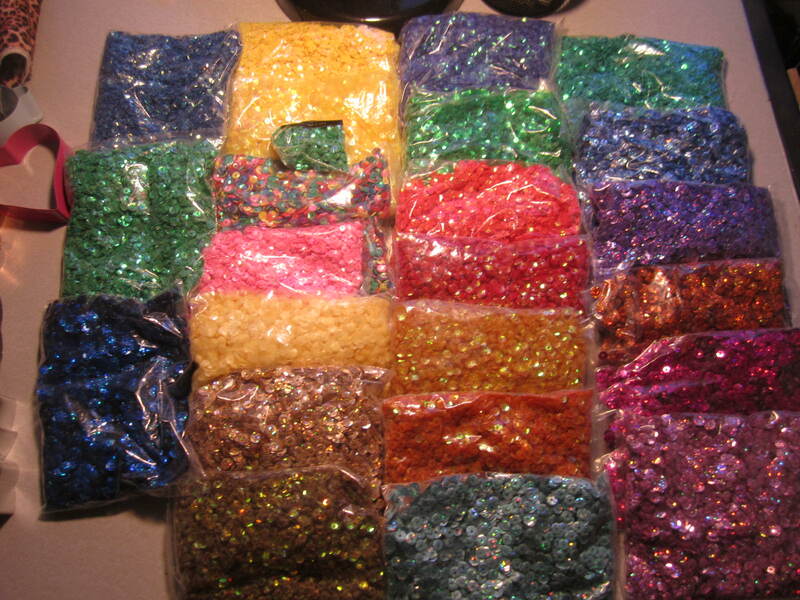 Here is just my newest additions of my huge stash of sequins.These are all the small bags, around a thousand each, depending on the sizes, smaller more, larger less, but the average is around 1000 to 1200 !! this is just a small taste of all the amazing colors I have. Here are the big bags, most have a duplicate as I tried to buy two of each. I did not photograph the duplicates here, but did in the box !! I put a small green bag on top of the yellow to show the difference !!! Such gorgeous colors !! You can see the holigram ones , so interesting !!! this bucket is full, most bags I have two of each, a few are only one. 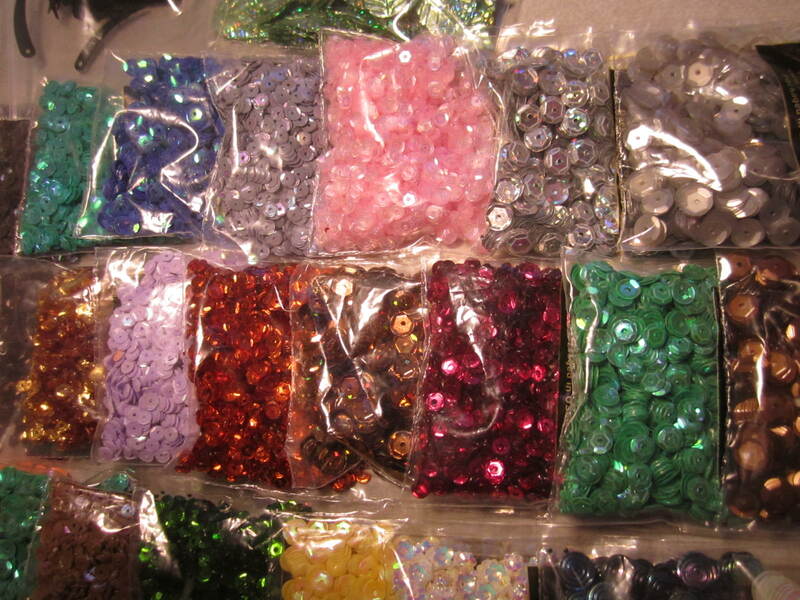 Got a great deal, plan to make some kits, and sell some cute bottles full of sequins too !!! 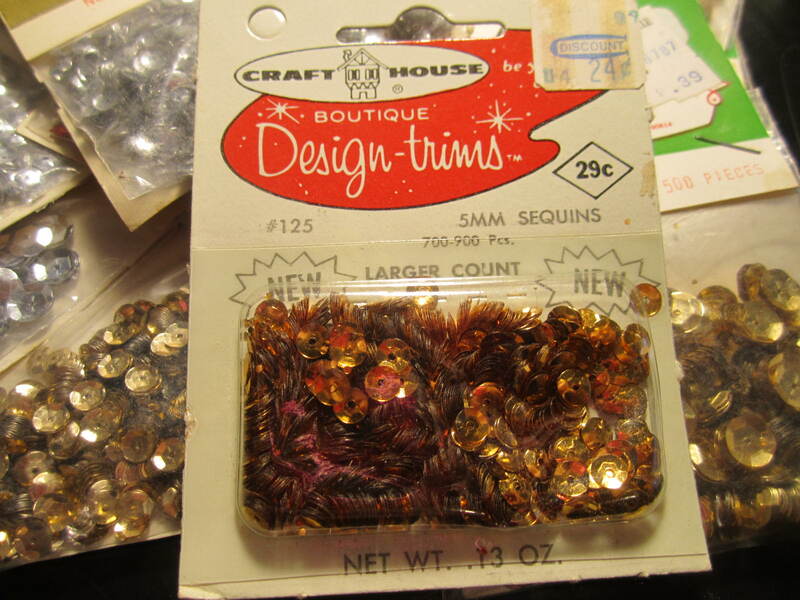 I found this fun collection online of vintage sequins. I thought they were just too wonderful to pass up. Most of the packages I will list in my new store. 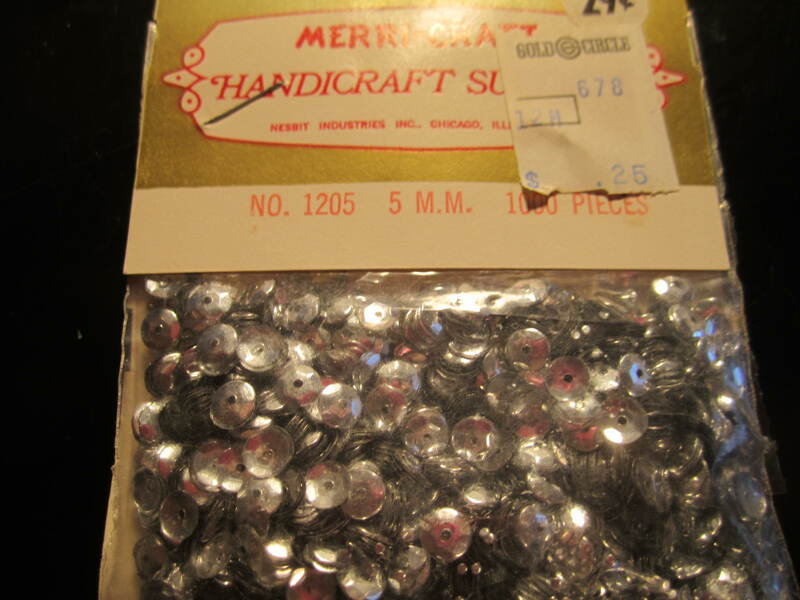 I know a lot of people love having the vintage sequins. These are all from the early sixties. I have 14 packages !!! I was thrilled !! Mainly golds and silvers and one red !!! Some of the more unique sequins I have !! Snow flakes, a long spikey thing, some black and white spotted each side is reversed, which is really awesome , flowers and I have many flowers in a lot of colors, this is just a bigger one, my others are much smaller, some big round whites and some pretty leaves. Again, just a taste of what I have. I have so much more. Some of my little bottles I plan to sell with sequins. I have not counted these, just put some in to see how they look. 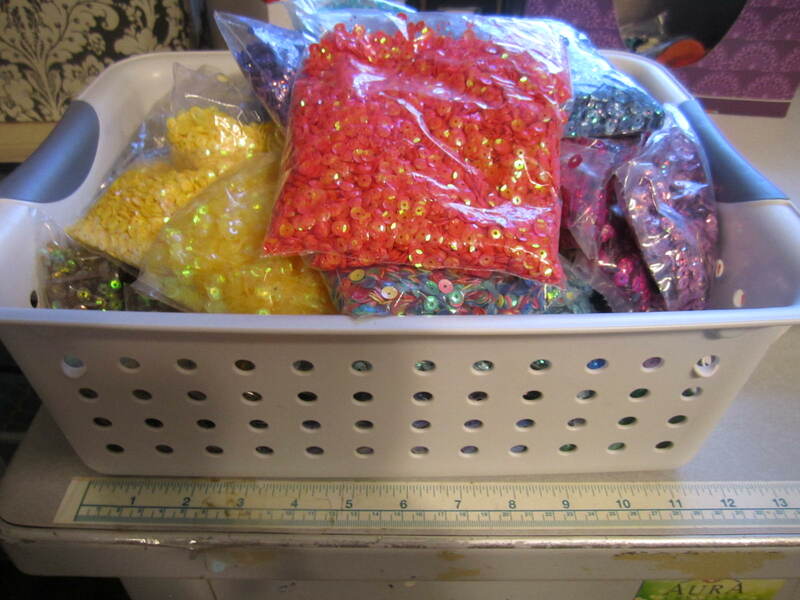 I actually purchased a scale that will count the sequins and seed beads for me, so that will make life so much easier for me as I can fill one bottle up, then pour it on the scale and find how many it is. Then I can make sure I measure them all the same. What a wonderful tool to have !! 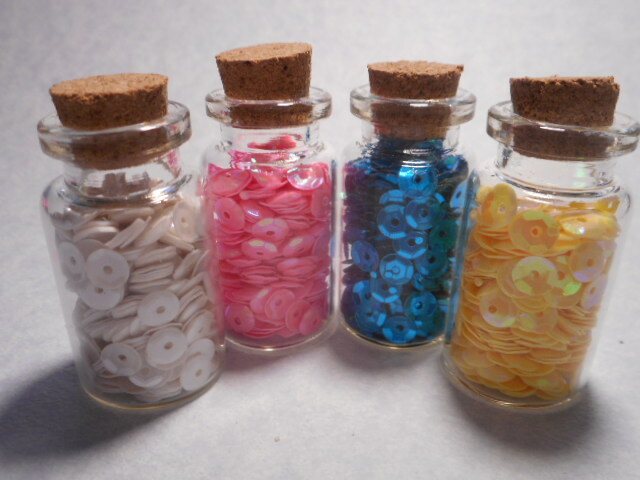 I have some even tinier bottles for the tiniest sequins, but they will be more for copper foiling with the sequins or beads inside to put on a necklace. 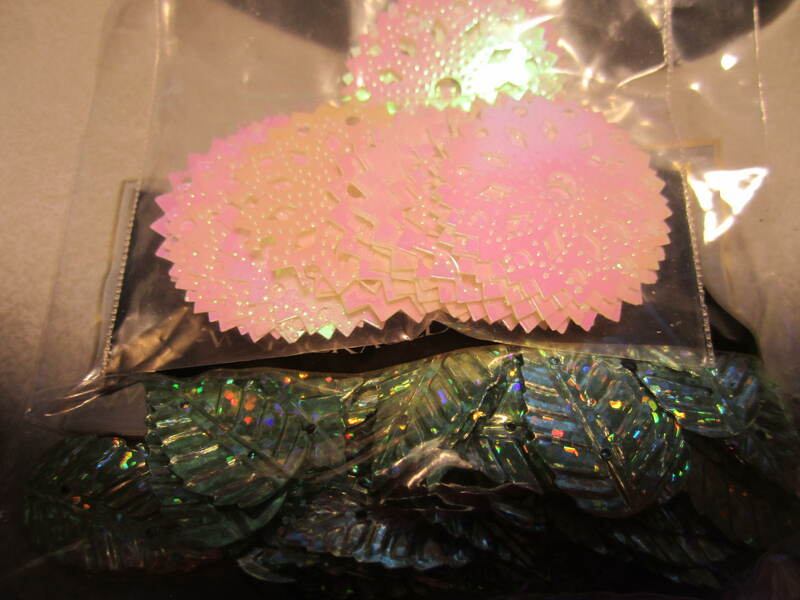 I am not sure I would sell them with the sequins loose but we will see. They are soooo tiny. 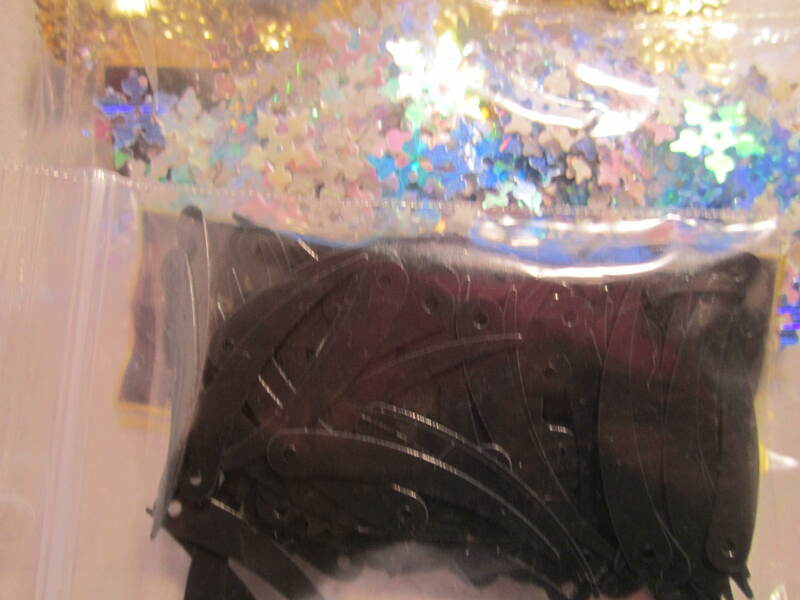 The scale will also help with the ornament kits, as I will need a certain amount of seed beads and sequins per kit. 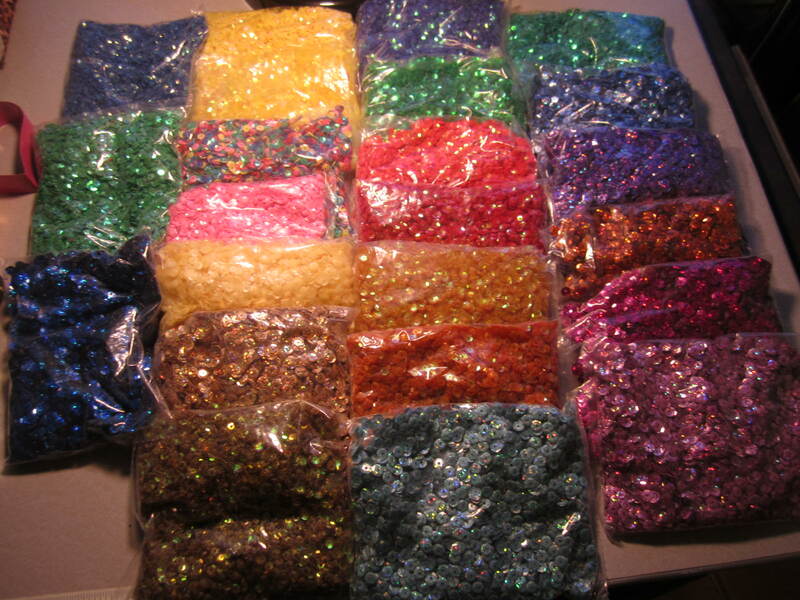 Not having to hand count each tiny bead and sequin will be worth every cent spent on that scale !! So, this is what I am playing with now. I am waiting for the logo for my new store to be done and then I will do a post for my store and share it with you. I will be selling all kinds of fun treasures for crafts and jewelry, beads, sequins, kits to make jewelry, and ornaments and a lot of hand made findings, mostly in sterling silver and copper. It will take time to get it fully done, but once I get enough product ready to launch it, it will go live. I purchased a domain and hope to go live at the start of September. I sill have to get my LLC, my local business license and my wholesale number . Once the logo is done, I will get the business cards done, but want to get the LLC first so it will be in the logo too. So, a lot to do, but getting there and will share here first when it is going live. 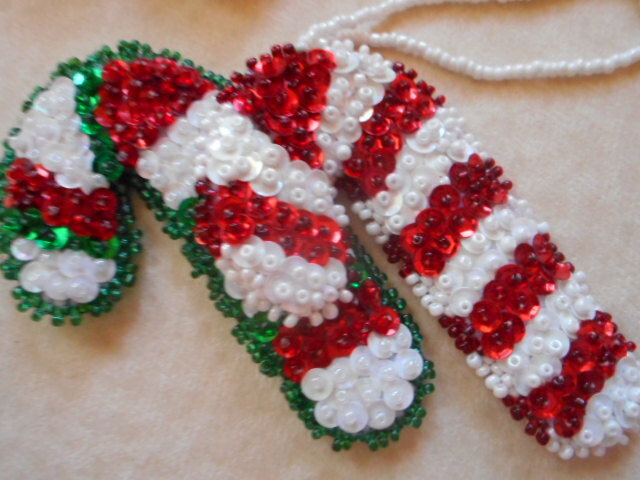 Some of the candy cane ornaments I will do kits for, but there will be many more than this in time !!! Christmas trees, ornaments, stockings, stars, and many non Christmas stuff too as ornaments can be non Christmas !! 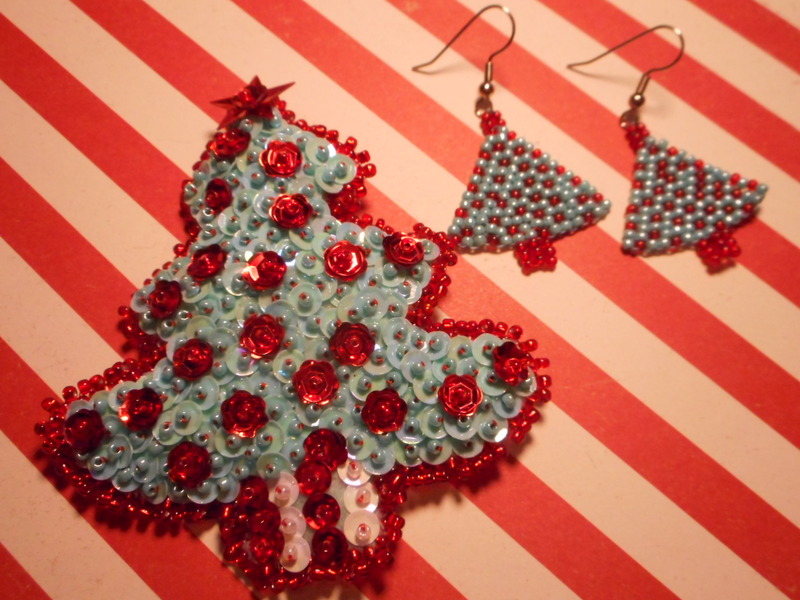 This tree in this color, green and traditional ornament colors, white with blue, white with read and I will do kits for the earrings for anyone that wants to make a pin like this instead of an ornament. Thanks for stopping by. I always appreciate it so much !!! ← A hot mess, cleaning up the studio !!! I am glad to read that you are going back to your passion. Your article was so informative about sequins. I have never worked with them and didn’t know they came in so many wonderful colors. I can’t wait to hear about your new shop opening. All the best! 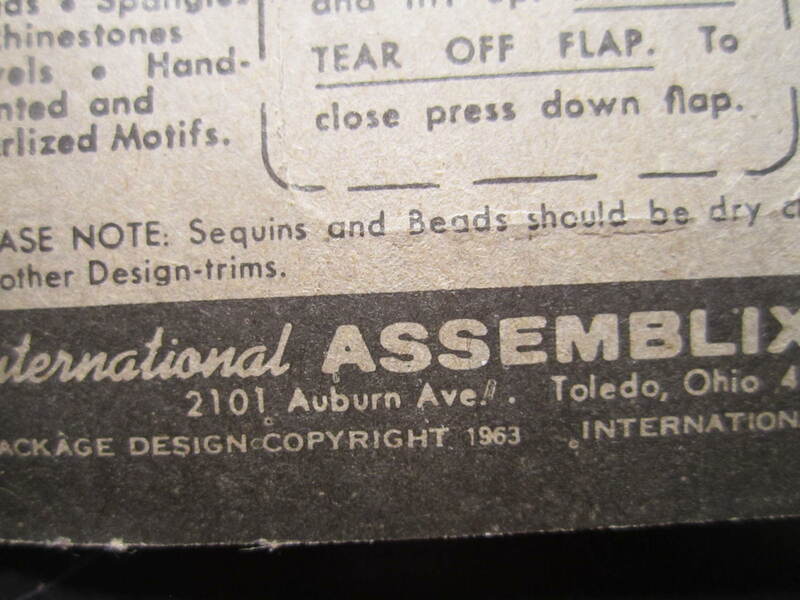 I plan to share a lot more info about sequins. There are so many kinds, it is in the thousands when you take all things into consideration, shape, size, color. It is a lot more than I could have ever thought ten years ago. I just do not know what I love them so much, but I sure do !!! They are my true creative passion !!! I love looking at them, let alone working with them !!! I am a bit overwelmed getting the shop up, totally out of my comfort zone, but we have some of the techical and business stuff to do and then I can start putting products in and get it live. I appreciate your good wishes , thank you !!! Hang in there. You can do it! I also finally realized my passion in beading was not necessarily what will sell, so I am doing it for me and any relatives or friends who admire my work. Sparkle on!! I am so happy you love sequins too !! You do have to do what you love, regardless if it sells. There is no joy in doing something for just money if it is not your passion !! When I finally realized that, I knew I had to stop and change courses. I am hoping to make some money, but I will be having fun no matter what !! 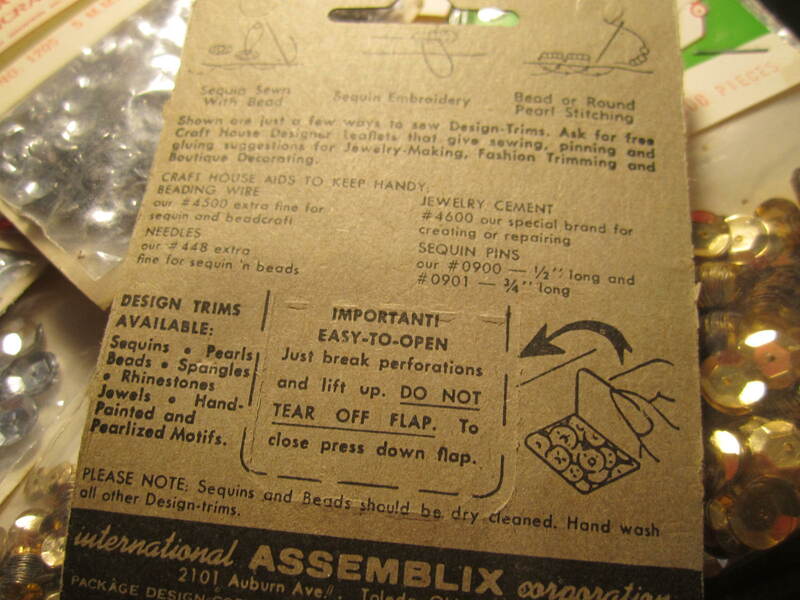 I just scored around 500 packages of vintage sequins, and possibly a few hundred more as they are getting more ready for me, and I cannot wait wait to use them in kits to make beaded ornaments, and just sell the more unique and unusual ones in the original packages for others to enjoy on my page !! Yes, got to sparkle on !! !